In the Tudor era (and probably in the Middle Ages too) it was customary for the executioner to ask the condemned's forgiveness. It was supposed to show that he held no malice towards the victim; that he was only an extension of the law doing his job. By granting forgiveness the condemned also had a chance of showing magnanimity in the face of death, thus leaving a good impression on the spectators. Lady Jane Grey forgave her executioner, as did Anne Boleyn and Catherine Howard before her. Who was Lady Jane Grey? She was designated queen by young king Edward Seymour (the son and successor of Henry VIII, as you remember). But when he died in 1553, she managed to be queen for only about 2 weeks, because Henry's daughter Mary Tudor had many supporters and so became queen the same year. The 17 year old Lady Jane Grey, though she didn't plot against Queen Mary herself, became a symbol of resistance and Protestantism and so became dangerous to the Catholic politics of Mary. Queen Mary had her executed for "high treason" in 1554. Even today historians aren't sure if she had a legitimate claim to the throne or not, so she's usually not included in a line-up of English regents. Hmm. That's quite a lot of death scenes in my portfolio so far. Perhaps I should paint a birth some time...! Nevermind. The next painting, of course, is going to feature Mary Tudor ("the Catholic" or "Bloody Mary" depending on whose side you're on). Wood and brick wall textures snatched from cgtextures.com . The ruins of her home Bradgate house stand in Bradgate park that's not far from where I live since I live on the outskirts of the city of Leicester, It's also said that her ghost haunts the ruins of Bradgate House, and is said to attend Christmas eve mass every year at the church at Newtown Linford, Peapole have heard the sound of a horse-drawn carriage going from the ruins of Bradgate House to Newtown Linford, some have seen the carriage and have even seen Lady Jane Grey holding her severed head in her lap. it's an amazing painting, so sad though, all that tragedy. well don e piece of art. Her claim was shaky at best. Edward had named her his successor in his will bypassing his half sisters Mary and Elizabeth. My understanding is she was the great granddaughter of one Thomas Grey. Looks like an Old World painting. Excellent! The look on her face is powerful! This execution was 1,000,000% unjustified. 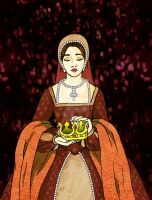 If Mary didn't want Lady Jane Grey to be the next queen, why didn't she speak up before the coronation took place? She had to have known that it was coming. Also, I don't think Lady Jane Grey actually ever wanted to be the Queen of England. It was Edward's idea, not Jane's. Finally, even if Lady Jane Grey had committed treason, that was no reason to execute her. The Bible endorses the death penalty for murderers (see Leviticus 24:17, "And he that killeth any man shall surely be put to death"), but not for what Lady Jane Grey did. I live in the United States, and I cannot understand why some murderers get the death penalty and some don't. I would give ALL convicted murderers the death penalty. And I would make their deaths painful deaths. For example, most executions in the United States are performed by lethal injection. But most murders in the United States are committed using guns and knives. Some are even committed with bombs. The Boston Marathon bomber should be executed the way Lady Jane Grey was executed. It would be more painful and the blade could be reused. I greatly enjoy your work. A great deal of people with "Royal" blood died due to fear by the current ruling branch of the family. While Mary would certainly be before Jane in the succession, there were certainly those rulers that had less strength in their claim to the throne before and after Jane. Looking forward to more of your work! Lady Jane was beheaded with an axe and chopping block; Anne Boleyn was beheaded with a sword, by a French executioner from Calais. Just wondering why Jane's executioner has a sword in his hand. There is also a chopping block, and a block was not usually used with a sword. Jane was beheaded in the morning, and in late afternoon, a prominent visitor arrived at the Tower, and Jane's headless body and head were still upon the scaffold, according to an account I read. Jane did indeed use a blindfold, and her confessor helped her find the block to place her neck, not being able to find it without her vision. Very excellent artwork, just not historically accurate (sword and chopping block and no blindfold) for this particular execution. I believe that the practice was to use the sword by itself (swung like a baseball bat) and the block was only used with the axe. Wow the figures have a strong expression. I can see what they feel! You specialize you on the middle age or? Thanks, I specialize in history illustration in general. I will watch you and be waiting for more awesome illustrations! I think I read a book about that poor girl. Heartbreaking to lose ones life at such a young age. But the pic is awesome. She was blindfolded in her execution if im not mistaken. Jane Grey did have a bit of claim to the throne since her mother, Lady Frances Grey was the daughter of Mary Tudor, Queen of France's daughter (King Henry VIII's younger sister). The thing was, her cousin Mary had a bigger claim being the daughter of Henry VIII and the will listed her as an heir to the throne despite her previous status as illegitimate. Somewhere I read that Jane first saw Mary as her friend then felt really betrayed when Mary sent her to die for no reason except for just 'being an obstacle' basically while some claim that Mary was forced to do it by the ambassadors of Spain telling her that her 'love' wouldn't come to England under the Protestant rule. Great, but Jane seymour died in childbirth. Yes, but this painting isn't of Jane Seymour. It's of Jane Grey. Well thought and researched premise for an artistic piece! APPLAUSE!! Wow, this reminds me of the Old Masters' work.. very impressive! I'm surprised to see a Lady Jane painting. This is a great painting. I'll have to show my sister, she was really into studying Lady Jane. She even dressed up as her for a school project. I SO love this artwork! Light and storytelling are really strong. I love how you have made Lady jane look so young!!!! I love the detail you put into these pieces. Specifically the facial expression, you can see the characters personality trough little hints you put here and there. The smirk and pretensious feel you get when looking at the man standing to the right, Lady Jane Grey's sadness and fear, you can also see how shy and young she is just with her positoning. Brilliant! Anyways, enough of my history chatter...... POOOOOORRRR JAAAANNNNEEEE!!!!!!!!!!!!! Wouldn't the executioner's blade be flat-tipped? He would have had an axe instead of a sword. Anne Boleyn had the Executioner from France come over and "do" her execution with a very sharp sword. The Lady Jane Grey-Dudley, although she might have been crowned (not) for 16 days, was abandoned by everyone she held near and dear once Queen Mary drew near. Even her father the Duke of Northumberland threw down his sword and hailed for Mary once he was beaten in the field. Mary didn't WANT to execute her cousin. She believed her to be innocent; but again, that whole Spanish marriage thing came into play and the ambassadors kept picking on her to execute Lady Jane otherwise Philip wasn't going to come to England. Poor Mary at 38 thought she could still give birth to a child and give England a male heir. She hadn't had regular menses for years and was probably already going through the uterine cancer which killed her two years later. Thanks for the clarification about the sword. Wow. You can really see how she feels at that moment. When ever I read Lady Janes story I feel really sorry for her she was so young and she just got caught between a rock and a hard place because of Mary who was such a tyrant. shes my favorite queen of England. A Queen who represented the Protestant democratic revolution against Catholic feudalism. A Queen who embodied republican revolt!